One of the nice simplifying factors about running a tuition-free online university is that you don’t need to fill out a request for 501(c)(3) status or other federal tax-related forms. With no revenue, the Internal Revenue Service isn’t interested in us. We can focus on our non-profit educational mission. You also may want to check out the first episode of Chancellor Conversations, which will be one of the official SMUG podcasts. A couple of posts I did using Utterz (Driving While Blogging and my story of attending the Giants game). My presentation on Facebook in Media Relations (I didn’t get to live-blog my co-presenters because we were using my laptop to drive the presentations, but Chuck Hester had a good story about using LinkedIn. Sally Falkow and Brian Solis led a great discussion of Social Media Strategy, and Dr. Georg Kolb and Frank Shaw’s presentations on PR in Today’s New Marketing Milieu also were helpful. Katie Paine’s Social Media Measurement presentation was a whirlwind, and I want to go through her slides in more detail. Duncan Wardle from Disney Parks gave the second keynote, which gave a glimpse of how a big brand is using social media, and the opening keynote from Charlie Rose was presented in an unusual interview-style format. 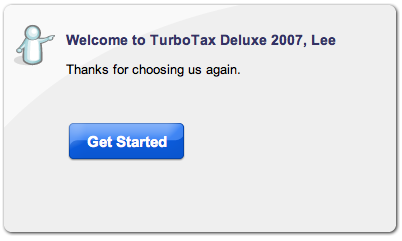 I’ll also maybe let you know how long TurboTax took. Of course no self-respecting do-it-yourself on-line Chancellor would do anything but electronic filing. I’ve used TurboTax before (though usually not this close to the deadline), and I like how it carries forward my information from year to year. Hopefully its servers won’t be slammed by fellow procrastinators.